Because Bike to Work week starts October 24th! This is a great initiative put on by HUB to get people out of their cars and onto their bikes and win prizes! You register for the week (you can do that here) as either a team or a solo rider. Next, you brag about how much fun it’s going to be and how it’s great exercise to all your friends and colleagues. 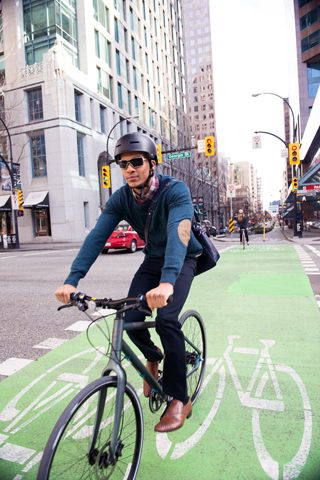 Log your trips during the official Bike to Work Week — this enters you to win some AMAZING prizes – including a trip for two to Amsterdam! You can log trips by mapping or entering your total KMs cycled. Don’t forget to check out the Celebration Station Map to find one along your route. At these pit stops you can wheel on by for free treats, mechanical services and more prize draws. There will also be a free outdoor Halloween Party on Friday, October 28th from 4pm-6pm at the corner of Union and Gore in Vancouver! 1. Plan Your Route Ahead of Time. Take bike routes, whenever possible. 2. Use a U-Lock or Folding Lock, not a Cable Lock. Watch our ‘No More Bike Theft Video’ for more bike locking tips. 3. Use a Basket, Pannier or Backpack to carry your stuff. 4. Always use lights. Even in the daylight, lights can help increase your visibility. 5. Wear Your Regular Clothes if possible. Ride at a leisurely pace and you will still look great upon arrival. MEC Great Rides: ride the Bikennale on Sun Oct 4! Bike to Work Week is May 25-31!